Despite high levels of motivation, Latino students in Montgomery County, Md., face major obstacles to their success, a new UMD study finds. Latino youths make up the largest ethnic group in the Montgomery County, Md., school system and show high levels of motivation, but face significant barriers to success in their studies, work and life, according to a new report by University of Maryland School of Public Health researchers. Among the report’s most troubling findings: A majority of Latino youths are unprepared for kindergarten, lag in reading ability throughout school, have the highest high school dropout rates, and are more likely than peers to exhibit symptoms of depression. “The Latino kids in our community are experiencing childhood adversities at much higher rates than other kids nationally or in Maryland,” said family science Assistant Professor Amy Lewin, who authored the study with doctoral student Andrew Conway. Latino youths in Montgomery County mostly come from Central America, with a majority from El Salvador, to escape war and other violence in their home countries, Lewin said. Separation from parents due to immigration-related challenges is a major factor for this population. Forty-five percent of Latino middle school and high school adolescents surveyed for this study reported experiencing separation from one or both parents due to immigration, Lewin said, and these separations last an average of six to nine years. Of youths born outside of the U.S., 71 percent experienced separation from parents. “This has huge implications for their psychological and brain development in ways that can affect their academic success,” she said. Academic achievement among Latino youths nationally has been improving, but that trend is not mirrored in the data collected for “The Promise of Latino Youth in Montgomery County” report prepared by Conway and Lewin for Identity, a nonprofit organization that provides wellness programs for Latino youths and their families. 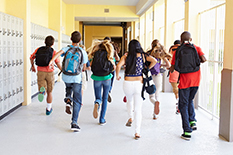 The report synthesized data from sources including Montgomery County Public Schools, the National Survey of Children’s Health and the Youth Risk Behavior Survey to provide a picture of socio-emotional, academic and workforce development trends among Latino youths, who comprise 32 percent of Montgomery County Public Schools enrollment, its fastest-growing population. The academic disparities they face from young childhood persist through to graduation rates and beyond, Lewin said. The long-term partnership between Identity and a team of researchers from the UMD School of Public Health is one piece of the effort to address the needs of Latino youths. In addition to providing research data that is serving as a call to action, Lewin and several faculty members from the Department of Family Science are training Identity staff about trauma and its impacts on kids’ behavior at different developmental stages, and conducting additional research on trauma and resilience in Latino immigrant youths. Students in the master’s program in couple and family therapy are providing supervised counseling services at one of Identity’s wellness center locations.